A petition to save the overnight sleeper rail service for the South West has been signed by 2,000 people. The Save Our Sleeper (SOS) campaign was launched in July to fight for the daily service between London and Penzance. The government has said the train loses £2.5m every year and it is feared it could be scrapped as part of the Great Western franchise renewal. 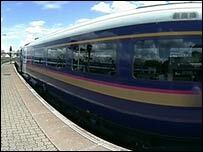 The train is popular with South West business travellers and is fully booked on many nights. Charles Kennedy, the leader of the Liberal Democrats, said losing the sleeper train would make it virtually impossible for people to travel from the region to London before midday. Included in the 2,000 signatures in the online petition, is a person from Brazil. The Strategic Rail Authority has insisted that no decision about the service has been made yet. The successful bidder for the new franchise, which will start on 1 April 2006, will be chosen by the Department of Transport.